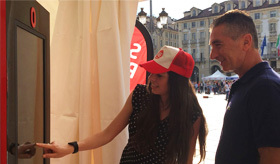 From May 12th to May13th ME The Selfie Machine has been active in Turin, in Piazza Castello, for the city marathon loved by the Turinese people: Stratorino. Stratorino, eighth stage of the Roadshow project which plans ME active in twenty events spread all along the 2018. Despite the bad weather the event was a success, with 160 photos taken among the two days of the event. ME was installed next to the stand where people enrolled for the marathon, entertaining hundreds of people who ran on Sunday morning. ME combines entertainment and marketing in a single tool, using fun and sharing to collect useful data for brands and communication agencies. 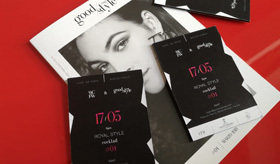 On Thursday May 17th Spx Lab will be at the exclusive Royal Style event in Monte Carlo, Cocktail Party organized by the luxury and life style magazine Goodstyle, in partnership with Spx Lab, Auleum and Cantine Antinori. The event which will be open to selected guests, will take place during the Monte Carlo Fashion Week, days in which parades, presentations and conferences will be held by the most famous brands in the fashion scene. The elegance of Monte Carlo and the audacious and vivid atmosphere of the fashion show will be background of the event, proposing the third Cocktail Party signed Goodstyle in collaboration with Spx Lab. ME The Selfie Machine was active at the Vinum event, the food and wine fair that celebrated the wines from 420 Italian producers, from Sunday, April 29th to Tuesday, May 1st. The event, prominent in the wine industry, had a lot of visibility on the territory bringing value and gathering thousands of visitors in two weekends. ME recorded a very high success, reaching 424 selfies taken and a lot of engagement on social networks, among shares and impressions. It’s also been held an instant win contest: 8 people per day were randomly selected for winning shopping vouchers from Mondovicino Outlet Village. 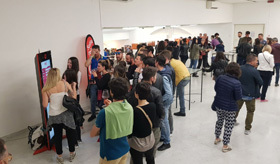 The chance of winning combined with the call to action 'shoot your selfie and share it’ entertained the users and animated the event, which enhanced a unique heritage, our Made in Italy. The Genoa Half Marathon, the most famous sporting event of Genoa, was held for the 2018 edition from April 13th to April 15th, gathering thousands of people in the streets of the Ligurian capital. ME The Selfie Machine was installed, to entertain participants and visitors during the three days, in different locations such as Piazza De Ferrari and Piazza Caricamento, s to involve people during the most important moments and initiatives of the event. The engagement was high with hundreds of photos taken, especially during the end of the race on Sunday morning, where runners showed their presence by taking a selfie and sharing their experience on social networks. The option of Instant Win, a random selection competition, was organized for the occasion by two different sponsors: Mondovicino Outlet Village and Energa Power. The proposal of 'gaming' contributed to the invitation to take a picture, leading users to "scratch" their phot to find out if they had won. ME The Selfie Machine, an entertainment and marketing tool, animated Genoa, increasing the online visibility of the national event. 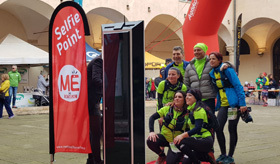 ME The Selfie Machine was installed in Borgo Marina d'Imperia for Sol&Vento 2018, the event that welcomed spring and was the fourth destination on the ME The Roadshow project's list. ME The Selfie Machine was active from April 7th to April 8th to engage visitors, to take selfies and publishing them live on social media networks. For the occasion, an Instant Win contest was also launched, a prize competition in partnership with Mondovicino Outlet Village, which invited users to scratch their photo to find out if they won a gift voucher worth €10. The winners were 8 per day and they were elected randomly; so the proposal of "game" and interaction led users to take more photos in order to increase their chance to win. The event, full of different initiatives and activities, had an increase in online visibility, given by the direct publication on social networks. The Instant Win proposal involved those attending the event and led to a big increase in the visibility of the sponsor as well. ME The Selfie Machine affirms itself as a tool which perfectly combines entertainment and marketing strategy, thanks to the vary possible actions: from sharing, to the initiatives of competitions and contests, up to the collection of useful data for the brand. 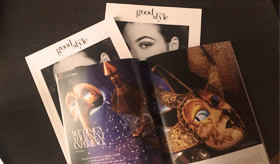 The fourth edition of the luxury trends magazine Goodstyle Mag, which has been published last month, dedicated an article to Spx Lab. The magazine opened with an overview of TaBi, one of our flagship products, an high tech object that was presented at the Style Affair event held in Venice on February 2nd at Ca 'Sagredo during the carnival, which "through images, texts and videos, leads the viewer to discover the history and characteristics of products and brands". The article was structured around the interview to Massimiliano Margarone, CEO of our Creative Laboratory, which shed light on the vision and motivations which gave rise to the SPX Lab project, bringing out how creativity and engineering sectors are becoming more and more intersected and complementary with the development of new technologies. We have dedicated the last months of 2017 to our launch on the market of Southeast Asia. Especially in Vietnam, which with an annual growth rate of 7% it's affirming itself as an emerging country open to innovation. 2018 began with important collaborations: companies from the most vary sectors gathered under one revolutionary vision made us reflect on the value of Made in Italy, too often taken for granted. From the ME The Selfie Machine project for Liò Occhiali, and their MIDO campaign "why do it in Italy? ", to our exploratory trip to the UAE, where our products have fascinated the audience, from Brussels where then our leading role has been strengthened to the program for the STARTS (Science Technology Arts) frontier and the recent participation at the Ampioraggio Day event in the Campidoglio on the innovation of the digital system. It is important to rediscover the courage to be Italian, by working on the continuous interpretation of the concept of Made in Italy. 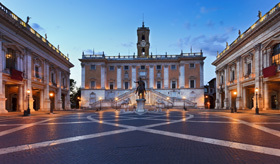 On Friday March 23rd ME The Selfie Machine has been innovation ambassador for the Ampioraggio Foundation during Ampioraggio Day, the national congress dedicated to the Open Innovation and digital development which was held in Rome at the Sala della Protomoteca of Campidoglio. 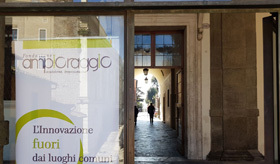 ME proved to be an excellent way to promote the activities of the Ampioraggio Foundation, including the important fundraising for the JazzInn initiative: a music event combined with meeting and discussions on digital progress. The use of ME has also contributed to spread the vision of the organization by sending material and increased the visibility of the online event, creating engagement and participation on social networks. Presented as an engaging marketing tool combining the attractiveness of the selfie trend along with the collection and management of useful data, ME The Selfie Machine has also been seen as an icon of digital change and innovation in front of investors, companies, entrepreneurs and startups. 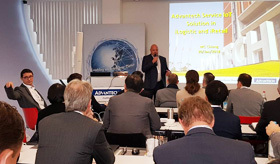 On January 30th to 31st, Spx participated at the Advantech iRetail & iLogistics Conference, the annual meeting of the official Advantech partners held in Munich, one of the European locations. The event took place during our collaboration with the giant Taiwanese for the relealization of the Mirò project which will be launched very soon, during the Salone del Mobile. The project, unique in its kind and at the moment kept under industrial secrecy, attracted the top of the Taiwanese company, that it's outlining a path of mutual cooperation and promotion. ME The Selfie Machine was installed in Finalborgo on March the 4th , for the Marchesato Trail 2018. The event organized by the Trailrunners Finale Ligure staff counted hundreds of participants for which ME recorded an average of fifty selfies per hour. 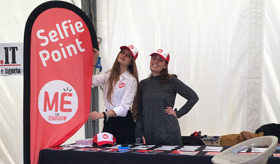 The involvement of the people at the event has been high, partly due to the contest launched for the occasion which invited the participants to vote for the best selfie on facebook. The fun of the selfie trend, the call to share it and the contest concerning the most liked picture have brought great results, such as increasing the online visibility of the event and the engagement on the social channels.